"The good things are the frontdesk staffs are nice and I had..."
Have a question for Elara by Hilton Grand Vacations? "Great room with a nice view and nice beds." "A great hotel smack in the heart of Vegas." 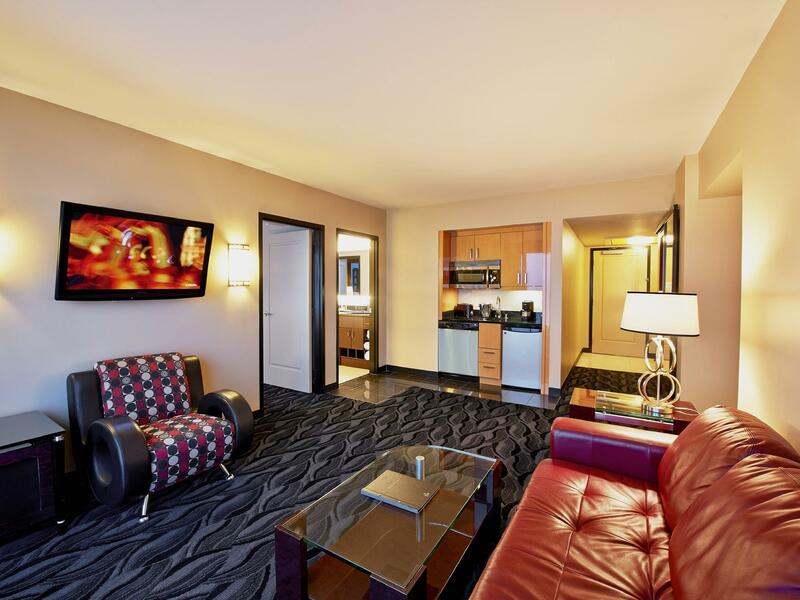 "Our room was beautiful - on the 33rd floor and recently renovated." "Was a nice play to stay at." 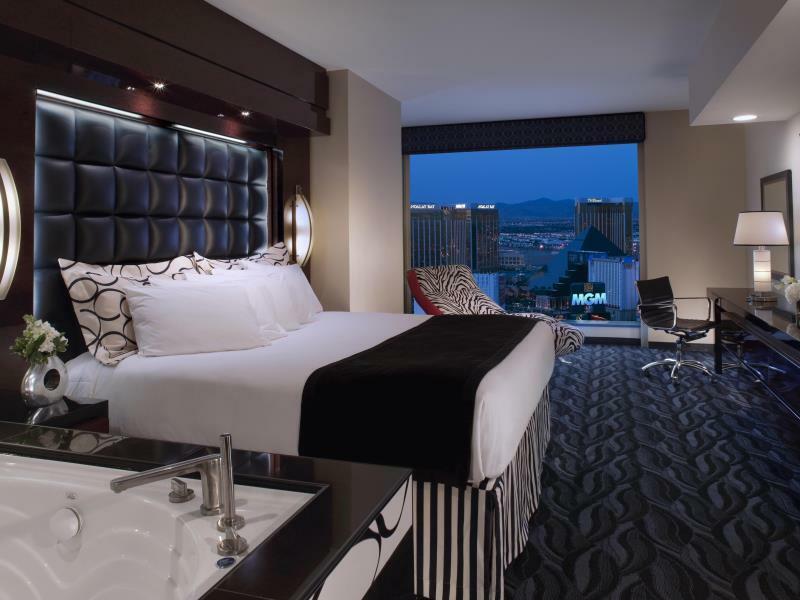 Located in the bustling heart of the Las Vegas Strip, the 4-star Elara by Hilton Grand Vacations combines an excellent location with service that’s second to none. Guests will find 1,201 well-appointed suites as well a tropical pool oasis complete with white sand and 32 cabanas. You wouldn’t want to miss the hotel’s signature spa treatment just steps away at the Planet Hollywood Spa by Mandara. The hotel also offers a grand entrance to Miracle Mile which features 170 retail stores and 15 restaurants. After a long day, retreat to your room where a soothing spa tub awaits you. 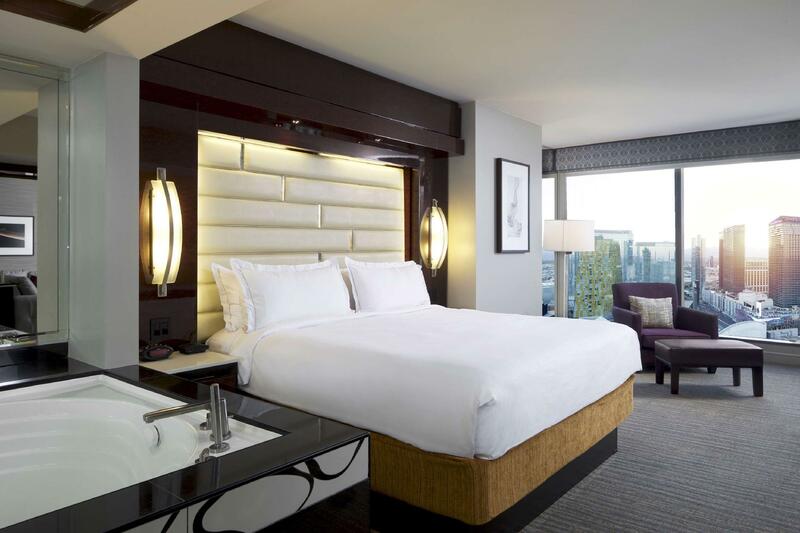 With innovative style as well as the very best in services and dining, the Elara by Hilton Grand Vacations is no doubt an excellent choice for a perfect getaway in Las Vegas. "I will visit here again!" Any type of extra bed is not available at this property. Very nice, nothing bad to say about this property in general. But the only problem we did have was quite significant to us. I was promised stay on a 'higher' floor by email from the property. We were in fact given low floor by the hotel standard, and were told we would have to pay extra $30 per day to get high floor. Maybe it was a try to get a tip by the counter clerk, I do not know, but for this reason only I would look to stay somewhere else in Vegas next time. Location is too good .. on maps it shows off the strip but its gate is connected to millenium shopping mall and it has all food joints shopping , planet hollywood and exit to strip .. actually i loved it there ! our suite was fantastic. we had a two bedroom with a sofa bed that easily accompanied myself and the 5 others in my party. 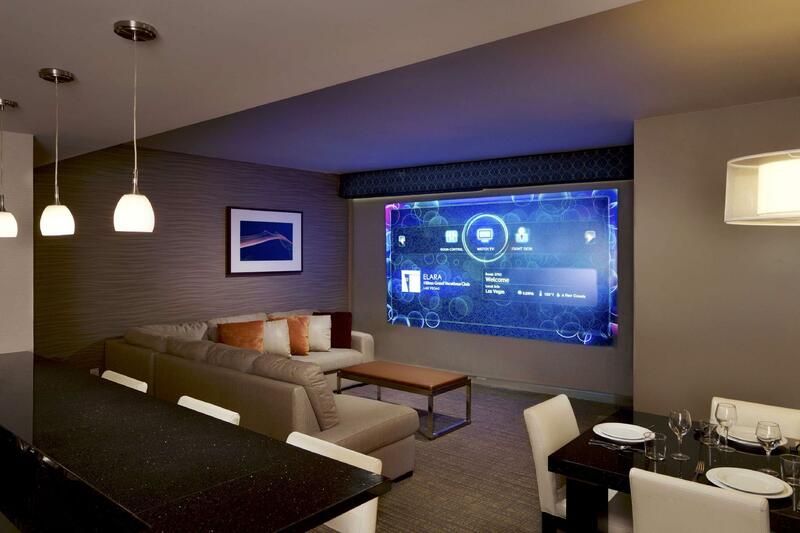 the suite comes with automatic curtains which doubles as a screen for the projector in the living room. the kitchen was very nice with stainless steel appliances, including a dishwasher. our room was comfortable and we enjoyed the in room jacuzzi. the views from our 32nd floor suite was of partial las vegas blvd. and of mccarron airport. at night it was pretty nice with all the lights from the city. the service was excellent. we had every issue promptly remedied and directions were given to us with a smile. we liked the location. we were just off the strip, you'll need to walk through the miracle mile shopping area to get to the strip. all in all we will definitely be back. thanks elara! Awesome hotel. Great service and it is in the best location on the strip if you like the action of going out and partying! The best part about the room is the hot tub in there. I loved that and it was so big and spacious. Definitely recommend you stay here - the rooms are nice and everything is good! You will totally enjoy your stay here. The mall is connected to the lobby of the hotel too. Booked a two bedroom suite with my husband and three kids for four nights. The suite was gorgeous with a fabulous view of Vegas. My 6 years old enjoyed watching the planes take off and land from our suite. kitchen was well equipped.Will certainly return. Arrived in the early evening. Check-in was very easy and took us less than 5 minutes. It is very close to strip, and only 5 minutes walk through Miracle Mile Mall will take you to the main strip. Pretty much everything is close by, Casino (Planet Holliwood), Bellagio, Flamingo, Paris, etc. Plenty of places to eat around as well. Staff were very helpful and they were available pretty much 24 hrs. This is casino free hotel, so less noise and less drunken people. Highly recommended! 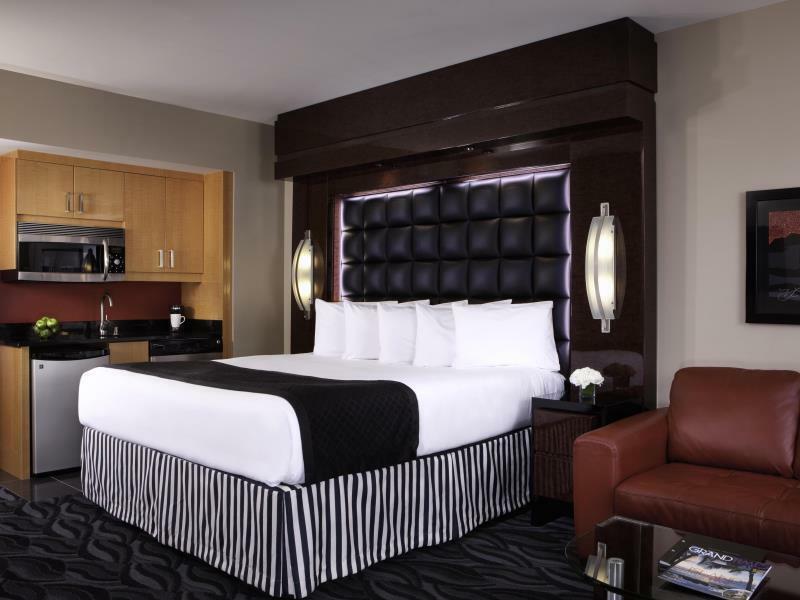 The Elara is a lovely hotel, well renovated with very comfortable and stylish rooms. The pool area is also very nice although a bit crowded in the afternoons. No chance of a sunbed during busier times of the year! It is also in a great location - right centre centre strip, just opposite the Bellagio. Would definitely stay here again and would definitely recommend to others. 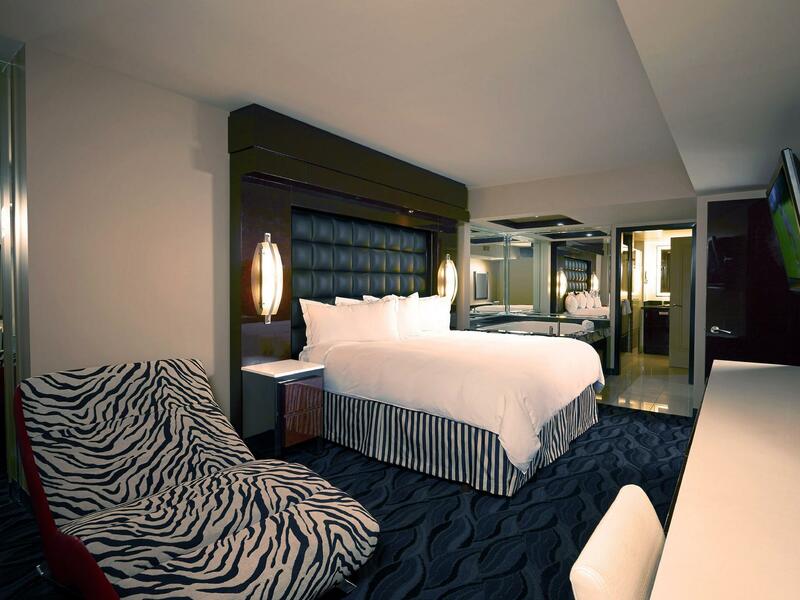 A great hotel smack in the heart of Vegas. Our room was beautiful - on the 33rd floor and recently renovated. We had an unobstructed view of the Eiffel Tower and could see some of the fountains at the Bellagio. This hotel is non-smoking, so a real breath of fresh air in Vegas. Parking was easy enough - although they share a parking garage with Planet Hollywood and the Miracle Mile shops - so parking is busy and can take ages to self park if you arrive at a busy time. Parking garage feels like hell - constant heat even under cover! The pool left much to be desired. It was small for such a large hotel and number of guests. People in hotel lobby could see right onto pool, so zero privacy for you and your swimming shorts... Wifi was not free - honestly, how ridiculous - this is 2017 no? Overall we loved our stay here, but would probably stay elsewhere next time due to the pool and wifi. Good price and a good spot. We liked the place and were happy with our choice. Only complaint is that when we asked how we could get in and out of the hotel without going through the enormous mall it sits on, the woman at reception told us we couldn't. So be prepared to walk through a lot of mall. I always look for a perfect resort type hotel that close to strip but not as noisy as most hotels in Vegas. This is my first time to stay in Elara and I am really surprise the welcome staff and comfortable design that highlight my trip! You can access very easily from planet hollywood of strip and enjoy your relax moment here! I will visit here again! we had a 1 bedroom apartment. Fantastic room with jacuzzi in the bedroom, kitchen/dinner/living room with lovely leather sofa and floor to ceiling windows, which when the blind was down you could watch the projector on. Hotel pool was lovely and we were always able to get a sun bed. The pedestrian entrance to the hotel was through the miracle mile shopping mall so although the hotel is not actually on the strip it is very close and we did have a view of it from the window. The hotel is exactly the same as the photos on all of the various websites advertising it. We were not disappointed and very happy we picked this hotel. The stay was great! The hotel is very beautiful and updated. The furniture is very nice and the room was very spacious and comfortable. The only thing I did not like was that there were some things around the room that were dirty and seemed to of not been cleaned. Also the restrooms did not have vents. Other than that i enjoyed my stay and hope to come back again. Loved it .. all except for one bell porter we had an amazing time.. he unfortunately soured the experience but when we reported it the management said they would deal with it. Otherwise the customer service was wonderful everyone friendly, and happy to help I would stay there again. In another review I read that it was hard to find in the mall, this is rubbish as it has an outside entrance and there are signs in the mall telling you where to go..
Elara was a nice hotel with everything at the doorstep. The room was nice and the bed was comfortable but the linen made my skin itch after a few days which cleared up straigt after I left. The miracle mile hotel and carpark were right next door and the bus stop was very close which was perfect for going to the north/south outlets and other great tourist spots. Better than expected. The room was beautiful with floor to ceiling windows and our room had the Eiffel Tower framed in them.. The eight foot projection TV was great for watching the elite eight. The staff were very friendly and the pool staff kept their newly remodeled pool area clean and comfortable. We have already inquired about returning within the next year. the only problem i had at this hotel was the bedlinen and towels were clean but i got a rash all over as the cleaning chemicals were still in the fabic somehow.i reported it to the house maid she changed my linen but it was still there........if you have sensitve skin to soap and detergents ..DO NOT STAY HERE...!! I stayed at the Elara last month for a friends birthday, the hotel is pretty nice, the location is good & they have plenty of spots to eat. Its connected to Planet Hollywood which is awesome because they have a casino & Earl of sandwich. Checking in & checking out was quick and we also requested a late check out (noon.) The only thing I can really complain about is valet, I believe it was $25 to valet your car, that ridiculous considering noon of the other hotel/resorts require payment for valet. it was connected to planet Hollywood. The stay was awesome.the theroom was great it came with a refrigerator and microwave.the staff was very nice and easy going despite the reviews on websites.I also liked that there is a security guy checking room keys before anyone gets on the elevators.I had a good stay the entire time.the only con was the $15 valet.